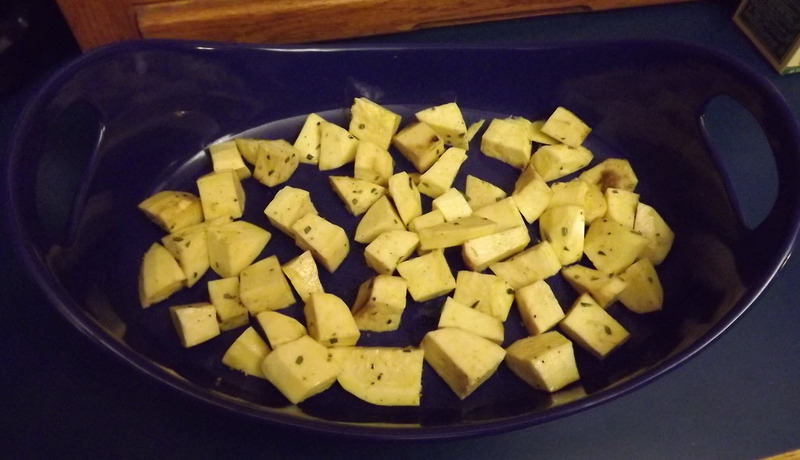 A few months ago when we were at the ol'in-laws for a few days, they served us Japanese Yams with dinner. Now, the Honey-Hub and I have never had much of a taste for yams but these are different! They are less starchy and less sweet than the traditional yam we are used to here. They are also lower in calories than a traditional yam or regular potato as well as being healthier for you in other ways. Where we live, they are not widely available in most grocery stores. Safeway, Albertson's nor Fred Meyer carry them. But I can find them at a local higher-end chain that we have here, Haggen's, and at the local Asian mega-mart, H Mart. They are cheap too. Haggen's has them for about a buck a pound and at H Mart they are priced less than $.60/lb although they are not as large as the ones found at Haggen's. 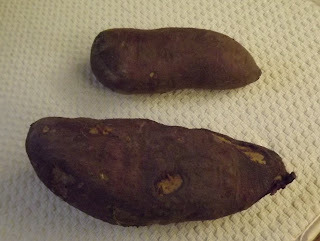 Japanese Yams, also called Asian Yams, Asian Sweet Potatoes, etc, have a dark purplish skin color but are white on the inside. 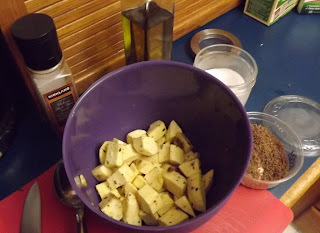 So far, I have cooked them two different ways, both of which are detailed in this post. Honey-Hub prefers the first method and I prefer the second method so I suppose we shall have to find a happy-medium. I look forward to making these for our friends at our next dinner gathering. Preheat the oven to 425 or 450. Wash yams very well and pat dry. Puncture the skin of each a few times with either a fork or a sharp knife. 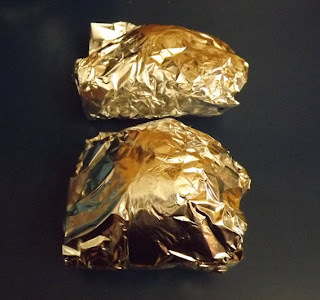 Cut off a piece of foil for each yam that is plenty big enough to wrap the yam in. 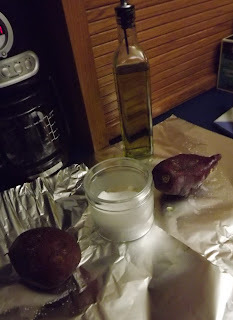 Put the yam on top of the foil, and lightly rub a little EVOO into the skin of the yam. Sprinkle lightly with some kosher salt. Repeat for all yams you are baking. Wrap each yam tightly in foil and put directly on the rack in the middle of the oven. Bake for 45-60 minutes, or until the yams are soft and the skin removes easily. Let the yams cool for about 10 min so they are easier to handle. The best way to get the skin off is to just rub... it should peel off pretty easy. You don't want to eat the skin. Cut/mash up the skinless cooked yams and add a little butter, salt and pepper. Enjoy! Note: It may take you a few times to perfect how long and at what exact temp to bake the yams. 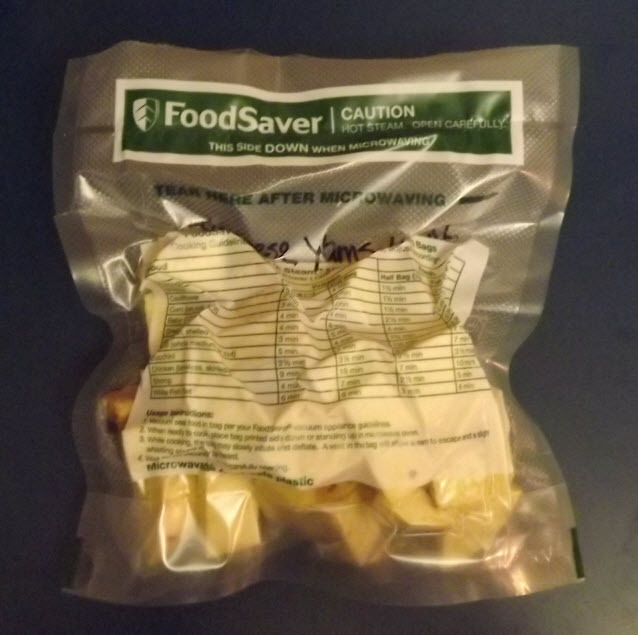 You can also pre-cook them for a few minutes in the microwave to cut down the baking time. A slightly under-baked Japanese Yam is NOT bad, but a perfectly baked one is delish! Preheat oven to 350 or 375. Wash yams very well and pat dry. Peel the skin off with a vegetable peeler as you would any other sort of potato. Cut up the peeled yams into 1"-1.5" pieces and put them in a bowl. Toss with EVOO, kosher salt, fresh ground pepper and fresh, minced rosemary (all to taste). I also tossed in a few pinches of my balsamic salt that I get from Whole Foods. 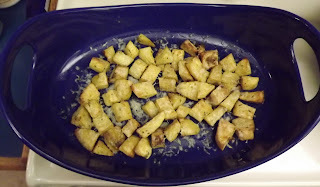 Arrange in a shallow baking dish and roast for about 30 minutes, giving them a toss after about 15 minutes. They are done when the skin is still firm but the cubes are easily pierced with a fork. As a tribute to my good friend, Jennifer, who is a missionary in France, I grated some Comte cheese over the top of the yams right after they came out of the oven with a Microplane grater. Tasty! We had a few leftover cooked yams and they re-heated the next day very nicely for my lunch. When I cleaned and cubed the yams, I went ahead and did 4 of them even though I only cooked 2 of them right away. The remainder I sealed with our Food Saver and put in the freezer so they are ready, after a thaw, for a quick side-dish another night. The baking dish seen in the pics is one of my Rachael Ray Bubble & Brown bakers. I have several of them already and am slowly collecting her whole line of stoneware. I LOVE them. They bake/roast food great, clean up is a snap and the built-in handles make it easy to grab them out of the oven.